A couple nights ago, Erik Parker’s new show opened at Mary Boone Gallery’s 5th Avenue space in New York. New Soul is a fresh body of work dominated by the locally-based artist’s series of tondos, his first time working with circular canvases. 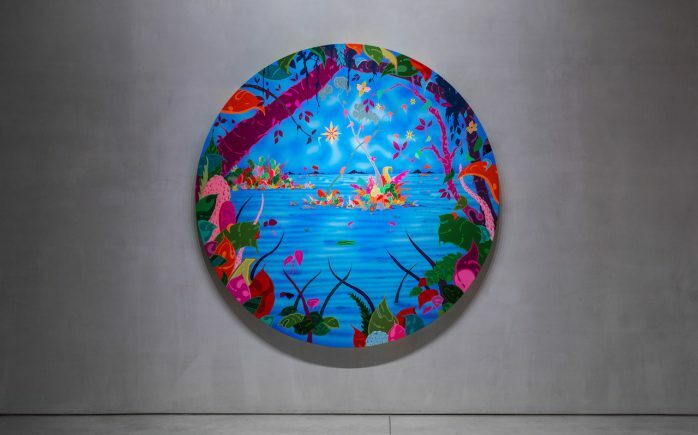 Utilizing his signature saturated palette, Parker has created lush landscapes with pools of water framed with vegetations spilling from the edges, with the view offered like peering into a hidden cartoon paradise. Also seen in the selection of works are face paintings, augmented by collage, presenting the contemporary portrait of a mind flush with images and information. Photo credit: Eddie Lee (for Hypebeast).